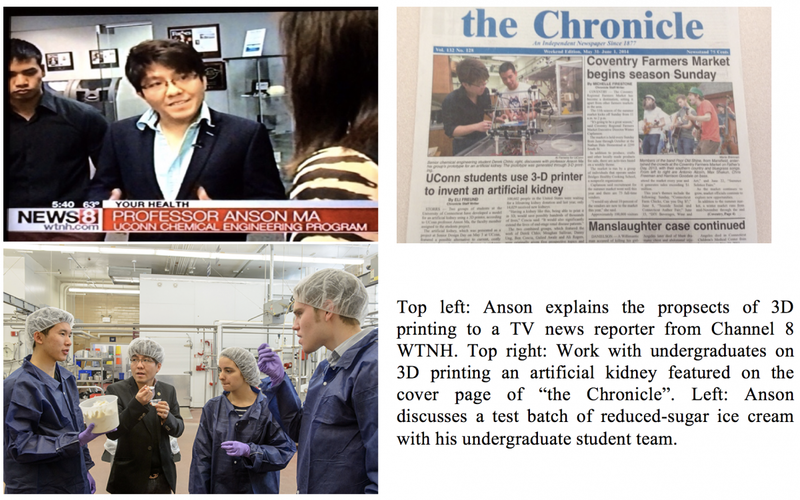 In December 2013, Anson represented UConn and leading U.S. young scientists to visit Japan through a prestigious exchange program established by the U.S. National Science Foundation (NSF) and the Ministry of Education, Culture, Sports, Science & Technology in Japan (MEXT). The program—akin to a science diplomacy-style program—aims to foster collaborations between U.S. and Japanese researchers in strategic areas. He spent five intensive days visiting top Japanese universities and research centers and met with fellow young researchers whose expertise complements and extends his work. In March 2014, he co-organized a workshop on Nanomaterials with John Hopkins Center for Talented Youth (CTY). The workshop was attended by more than 100 middle school and high school students and their parents from 10 different home states. In 2013, Anson led two teams of senior Chemical Engineering students to design an artificial kidney. This work has since then been featured on UConn Today and subsequently on the front page of The Chronicle. The kidney prototypes were showcased at one of Google’s events in New York City to engage girls in science. Further, he did two separate TV interviews for Channel 8 WTNH News and Channel 3 WFSB News, discussing how 3D printing may change our lives. In 2014, Anson initiated a capstone design project, in collaboration with the UConn Creamery, on developing a reduced-sugar ice cream so that families with diabetes can also enjoy ice cream and quality family time at the UConn Dairy Bar. This work has been featured on UConn Today. He was later approached by the CEO and President of a major natural sweetener manufacturer about partnership. Anson served as a panelist for the inaugural UConn Science Salon on “3D Printing: Living Tissue to Human Organ” attended by more than 120 people. The purpose of the event is to enhance public discourse at the intersection of science and culture. To engage local industry, Anson volunteered and taught two workshops for Rogers Corporation (Rogers, CT) and Altana BYK Additives and Instruments (Wallingford, CT), respectively, in 2014. In summer 2015, Anson co-taught a short course with Dr. Raji Kasi (CHEM) on “Introduction to Polymer Science” for IMS’s Industrial Affiliates Program (IAP). He volunteered to co-teach another industry short course with Dr. Rainer Hebert (MSE) on “Additive Manufacturing and 3D Printing” in Sept 2015. Anson co-organized and presented at the non-profit Connecticut Youth Forum (YF) in Oct 2015 at UConn. Connecticut YF is a nonprofit community outreach program of the Connecticut Forum. The mission of YF is to bring teenagers together through discussion and action while providing opportunities for growth and exploration. Each year, the program empowers over 700 urban, suburban and rural youth through civil dialogue, service learning, and leadership development activities. Anson currently serves on the Technical Council of America’s Flexible Hybrid Electronics Manufacturing Innovation Institute (NextFlex). NextFlex is supported by $75 million in federal funding over five years, with $96 million in cost sharing from private and public sources. Anson organized a workshop at UConn attended by more than 40 participants from academia, industry, and the state of Connecticut. Anson led a funded NSF proposal with UMass Lowell and Georgia Tech to establish a national industry-university cooperative research center (I/UCRC) for additive manufacturing. Two industry webinars were offered to more than 70 company representatives and the first planning meeting was held in September 2017. Anson is currently on sabbatical leave with Unilever with more than 2.5 billion people worldwide using their popular brands like Dove, Vaseline, Ponds, TRESemmé, Knorr, Lipton, AXE, and Magnum and a turnover of more than €52.7 billion in 2016. In addition to consulting on technical projects, Anson is responsible for building a Connecticut-based ecosystem.